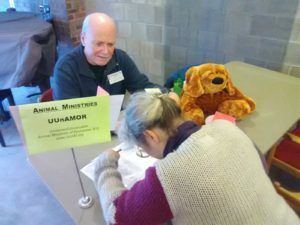 Animal Ministries of Rochester NY (UUnAMOR ~ pronounced you-nah-more) tabled at (Winton Road) First Unitarian’s Petition Weekend, March 11-12, 2017. Lois Baum created the petition and prepared postcards (environmental move to save on paper envelopes). Greg Baum tabled for UUnAMOR this year (see attached photo). Many people came through, before and after all 3 church services, and signed the petition and postcards. They have been mailed to our N.Y.S. Assembly representatives, requesting that they pass A.1596: Kirby and Quigley’s Law. Amazingly, it is not (yet) illegal to harm or kill a companion animal in the midst of another crime (ie: burglary, arson, etc). This bill, A.1596, would make it a felony to harm or kill companion animals during a crime, on top of the charge for the crime itself. If you want to see that A.1596 passes, please contact your NY state (not federal) Assemblymember. Thank you to Lois and Greg for your advocacy.